Most of us know we should be more physically active, more often, but it can be a challenge given our busy schedules. Taking the stairs, going for a walk at lunch, or taking transit to school are easy ways to get our bodies moving and to build physical activity into a daily routine. Physical activity is important at every age and is recognized as one of the most effective ways to bring down the risk for chronic disease. Since its inception, BCAHL has been a champion for supportive environments, policies and programs that make it easier for British Columbians to be regularly active. 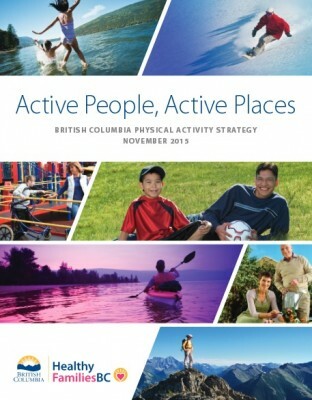 A renewed focus on increasing activity levels in our province has led to the development of the BC Physical Activity Strategy: Active People, Active Places which builds on the work of health authorities, non-governmental organizations, the private sector, local governments and government ministries. This provincial strategy includes a framework for action and the key elements which guide it: a life course approach, an equity lens and a focus on supportive environments and partnerships. BCAHL, in partnership with the Ministry of Health, is leading the implementation of the Physical Activity Strategy Action Plan. BCAHL is pleased to bring to this plan, experience gained from managing the Winning Legacies Physical Activity Strategy from 2007 – 2010, which included initiatives such as, Everybody Active and the BEAT (Built Environment and Active Transportation). Active People, Active Places is designed to guide and stimulate co-ordinated policies, practices and programs in physical activity that will improve the health and well-being of British Columbians, and the communities in which they live, learn, work and play. It aims to foster active people and active places. BCAHL is pleased to be part of Active People, Active Places. As well as the benefits to physical health, we believe that it will have broader benefits for British Columbians – improving our sense of well-being and community connectedness. Since 2016, BCAHL has been working with several organizations to implement initiatives funded under the BC Ministry of Health’s Physical Activity Strategy. Together, these initiatives are part of BC’s Active People, Active Places Action Plan to help British Columbians be physically active in environments that support and encourage active living. Mind Fit: Building mental and physical competency and confidence through a combined mental health and physical activity program for youth who have symptoms of mild to moderate depression. Youth Inclusion: Building capacity within the recreation sector to include marginalized youth in physical activity. Active and Safe: An online resource for sport and physical activity injury prevention information and strategies for athletes, coaches, officials, teachers, parents, and health professionals. Active Communities: A grant program intended to increase the availability of physical activity opportunities in BC communities through improved access and inclusivity, healthy community design, and healthy public policy. Physical Literacy for Communities – BC: Training and mentoring of community champions, educators, and health professionals to build physical literacy in BC communities. Aboriginal Healthy Living Activities: Capacity building for healthy living leaders to increase physical activity opportunities and participation across First Nations communities in BC. Cultural Learning: Increasing the cultural understanding across provincial sport organizations in BC to better include First Nations athletes. Appetite to Play: Training early years providers across BC to incorporate physical literacy learning opportunities in early years settings.